Wolfsburg head coach Dieter Hecking insists Kevin De Bruyne is going nowhere this summer even though Manchester City continue to be linked with the Belgium international. The 24-year-old has scored 13 times in 50 Bundesliga appearances for Wolfsburg since moving to the club for £18million from Chelsea in January 2014. He struggled to break into the first team at Stamford Bridge, making only three Premier League appearances for the club during his two-year stay in west London, but has revived his career in Germany. I think he will stay for a minimum one more year at Wolfsburg. Earlier in the week Edin Dzeko, who moved from Wolfsburg to City, 1/1 to win the Premier League title in 2015/16, in January 2011, had indicated that he thought a transfer would not be in De Bruyne's best interests at this stage of his career. Meanwhile, Hecking said after his side's 1-1 draw at Ajax on Friday: "Kevin is a player the world wants. "I think he will stay for a minimum one more year at Wolfsburg." 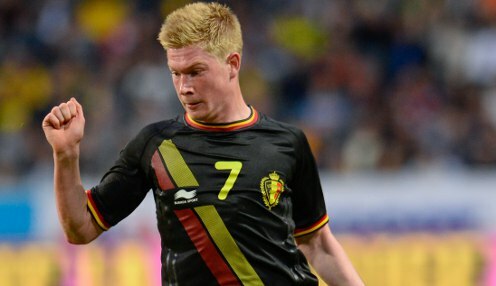 De Bruyne has made 25 appearances for Belgium since making his full debut in 2010 and was part of the squad that reached the World Cup quarter-finals last summer. Belgium, who were beaten by Wales in a qualifier last month, are 1/1 to win Euro 2016 outright.